In 1994 a group of 12 artists in the Cowichan Valley on Vancouver Island met to discuss the need for a permanent showcase for selling their artwork beyond the usual venues of craft fairs and exhibitions. Though the initial group changed, a core group of 9 opened their first tiny storefront in downtown Duncan in August of that year. They called themselves IMAGINE THAT! ARTISANS' DESIGNS. They are a Registered Co-operative. August 2018 marked the beginning of the 25th year in business for this very successful artist-run store. All work is juried and is of very high quality, with price ranges for even the smallest budget. The Members are justifiably proud of their long record supporting local Cowichan artists and other artists from Vancouver Island. Mid way between VICTORIA and NANAIMO, their great location is at the heart of the Cowichan Valley in historic downtown Duncan. IMAGINE THAT! is a pleasant place to turn off the TransCanada and have an artistic "refuelling" stop. Look for the red brick City Hall. We're across the square. Imagine that! 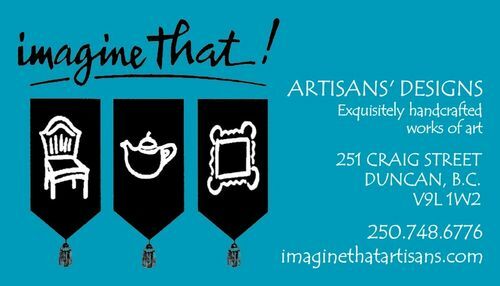 is proudly Canadian, with most works made in the Cowichan Valley or in the surrounding towns of Chemainus, Ladysmith, Nanaimo, and Victoria. Imagine That! Artisans' Designs features the work of 70-some professional artisans and artists. Each day, you will meet one of our working artists helping to operate the shop and make it the success it is. Come in and say hello. Every month the displays change in both store front windows. 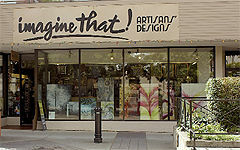 These windows are available for artists to rent and are booked well in advance.